Let me start by introducing myself. I am Dr. David Bearman, I am considered to be one of the most clinically knowledgeable physicians in the eld of medical cannabis in the United States. I have spent 40 years working in substance and drug abuse treatment and prevention programs. I was a pioneer in the free and community clinics that are now available to Americans everywhere. I was even a member of then-California Governor Ronald Reagan’s Interagency Task Force on Drug Abuse. I urge you, to take medical cannabis seriously and not only allow state programs to continue to flourish but urge the president, the DEA, Congress and FDA to work on seriously reconsidering America’s current drug laws and policies. This, unlike almost everything else, is not a partisan issue. There are many Republicans, like Dana Rohrabacher (California), who believe that Mr. Trump understands the medicinal use of cannabis. Dr. Ron Paul (Texas) has supported the state rights’ view that regulating medicine is a power of the state. His son, Mr. Rand Paul (Kentucky), also a physician, also recognizes that the 1925 SCOTUS decision Linder v the United States and the 9th and 10th Amendments to the Constitution that give states, not the federal government, the right to regulate the practice of medicine. Mr. Sessions, you are a lucky man if none of your family and friends su er from multiple sclerosis, Parkinson’s Disease, Alzheimer’s Disease, ulcerative colitis, Crohn’s Disease, seizures, migraine headaches, ADD/ ADHD, PTSD, autism spectrum disorder or cancer. These are all medical conditions that thousands of years of history, tens of thousands of research studies and modern experience with millions of patients are proven to be relieved with botanical cannabis. One of the most exciting potential therapeutic bene ts is the well documented (in basic science studies) anti-cancer potential of cannabinoids. Dr. Donald Abrams, oncologist and professor at UCSF School of Medicine, has said there is more than enough basic scientific evidence and anecdotal reports to justify doing human clinical trials to determine if cannabis can actually cure cancer. Currently, human trials are ongoing in the United Kingdom and Israel on the use of cannabis to cure glioblastoma multiforme. This is based on research done in Spain by Manuel Guzman and in Italy by Vincenzo Di Marzo, PhD and Israel by Raphael Mechoulam, Ph.D. I have no doubt you have good intentions, Mr. 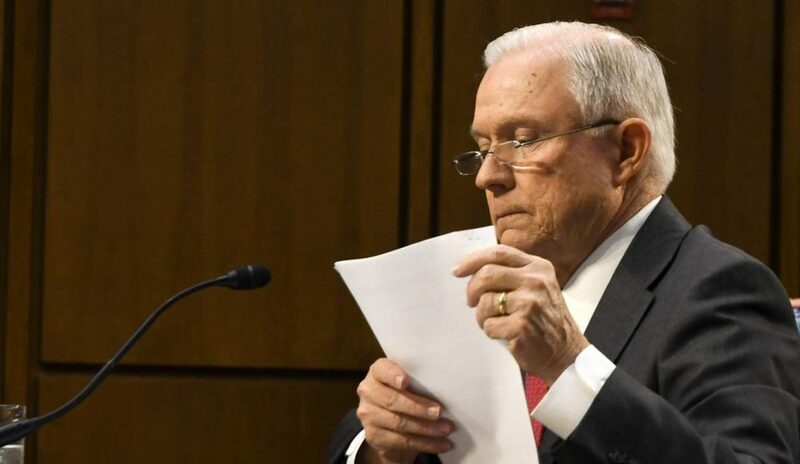 Sessions, however a more aggressive stance by the federal government in utilizing the 1942 Supreme Court decision Wickert v. Filburn to stretch the commerce clause of the Constitution beyond all recognition will not only threaten states rights, but quite likely will interfere with treatment of many who have been receiving palliation, therapeutic and possibly life extending benefit from the medicinal use of cannabis. Mr. Sessions, you owe it to the ill people of the United States who bene t from cannabis to educate yourself on the long history and substantial research on the medicinal value of cannabis. You can do it in private by viewing any of the following videos: “Medicinal Cannabis and It’s Impact on Human Health,” “What If Cannabis Cured Cancer” and the CNN Sanjay Gupta, MD documentary. If after learning more you would like to educate the staff of the AG’s office in DC regarding cannabis, cannabinoids and the endocannabinoid system, I would be happy to arrange such a presentation, through physician members of the American Academy of Cannabinoid Medicine. This medicinal use of cannabis is serious science and medicine. I am con dent that an open-minded review of the science will in- form you that the government needs to do more to promote scientic research in the medicinal use of cannabis and to do less to interfere with the treatment of the ill. Yes it helps with chronic pain as well I have been living with arthritis and bone spurs on my spine. I found out I had it about a year ago after being in and out of the hospital with back pain for a year before that. Ive been on all kinds of muscle relaxers and steroids and have now been on my pain meds for a year. And I hate it. Absolutely hate it. I completely depend on them now to be able to go to work or even clean house or do laundry or cook. Otherwise I cant get out of bed most days without them due to the pain but if I can have a edible or smoke a little I dont have to have a pain pill. And that’s what I want to be able to live freely without my pain meds because I’ve only been on them for a year but I can already tell that I’m becoming addicted to them. And my body is getting used to them. When I first was put on the pain meds I could barely take half of one let alone a whole one without passing out….now I can take a whole one just fine! That’s not where I wanna be!! I’m scared to death in going to become completely dependant and addicted to my pain meds and cannibas can take care of that problem for me and many other Americans!! Not to mention I can treat not only my pain with it but also my depression and anxiety! All with one PLANT instead of so many different pills….